Photo tape measuring app for your iPhone or iPad. ...Yeah... that just happened, watch the longer video preview at the 'Developer Website' link below. 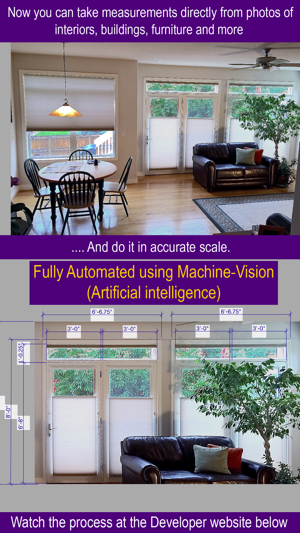 That is the app using Artificial intelligence (Machine vision) to create one touch fully automatic perspective correction of your photos to accurate frames and accurate proportions and even a good start estimate of the size of the main object in the final drawing too, (the final scale can then be easily adjusted to make the dimensions fully accurate from that starting A.I. estimate of scale). And yes you saw that correctly in the video, even a first round of automated dimensions too, easily added to, or cut out with some very usable built-in tools in this app. look at the 'developer website' and then instructions for example/instruction video's to see if this app will work for you. Take photo and add scaled measurements right on the photo, accurate and extremely quick combined (universal) iPhone & iPad app. Measuring calculator for construction, a photo measuring app. Also an image tape Measure app for DIY measures of walls, both interior or exterior. 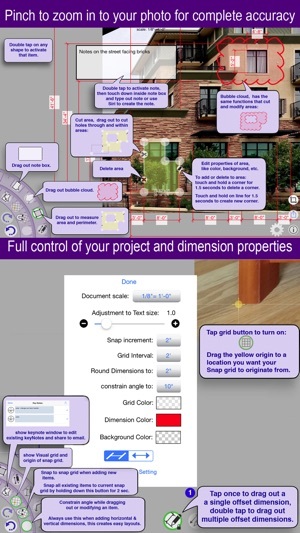 Distance and length measuring app for Architects and contractors. 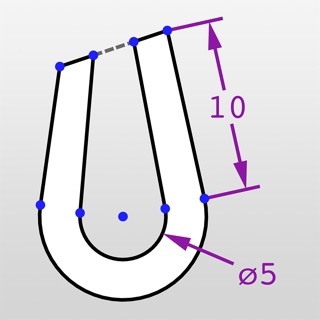 Calculates the Area and Perimeter of any shape you draw, or image you trace. ◉ Draw accurate Areas and perimeters with built-in tools in the app. ◉ Draw accurate dimensions on your photos, and do it to correct scale. ◉ Draw bubble detail clouds and keyNotes. ◉ Draw note boxes and use Siri to add the notes. ◉ Pinch and zoom into your photo to nearly the pixel level for complete accuracy. You have full control of your project properties, and dimension properties including color and line thickness. ◉ Change to metric or to Imperial dimensions, set up a snap grid, and/or a visual grid, also you can round your dimensions accurately. ◉ Constrain the angle of your dimensions, change the color and text background of your dimensions. 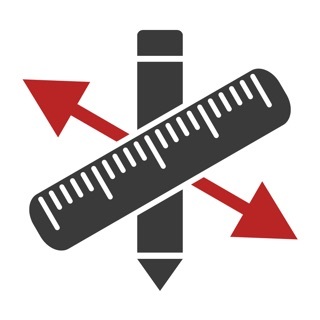 ◉ Use Direct arrow dimensions, or professional Architectural offset dimensions. 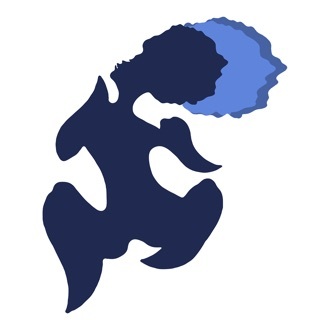 ◉ Full undo and redo support. ◉ Save your finished photo to your Camera Roll, and then share to your photo stream, or email your new drawing. 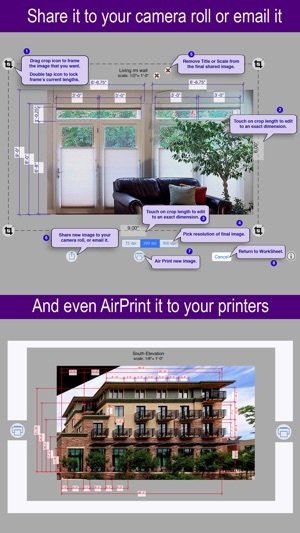 Also AirPrint to your printers with correct scale and take a scale/ruler and measure even more objects in the photo. Professional Perspective Correction of your photos to accurate scale. Now you can take measurements directly from photos of interiors, buildings, and furniture. For construction/contractor quality management auditing, estimating for takeoffs, punch lists, incomplete work list, defects list, safety inspections, site progress reporting, site diary, site audits, as built documentation, and real estate project management. 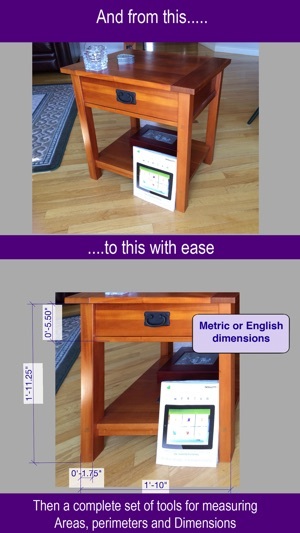 Industry Standard scales and dimensions for real estate agents, engineers, architects, contractors and DIY projects. 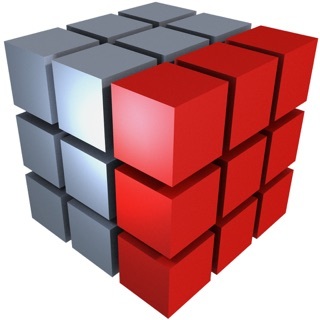 See the Instructions and tools at "Developer Website" link below. 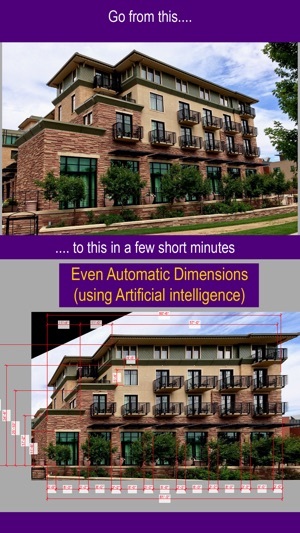 further improved the Perspective correction that the A.I. finds. added the ability to turn off perspective correction, where you can type in notes and 'dumb' dimensions on the original image. A lot of new tools added. undo and redo support added. My promise to you is that as Apple adds new app capabilities and I find new uses, I will continually improve the app so it is as effortless for you as possible to create these dimensioned drawings. My “Pay it forward” to you. First update this app and explore the new features, and if you've found the app useful in the past and like the new features, click on this "App Store" app again, Look in the "Reviews" tab for "Write a Review > " near middle of page and write a review and/or rate this app, also you can email me directly in the "i" button within your app with any suggestions you might have for the app, as always, I'll get back to you ASAP. Thoughtful reviews provide an incentive for the large expenditure of time it takes for me to continually improve the app so it is your best tool you reach for, and the best app it can possibly be, period. I'm an engineering supervisor for a major structural steel company and I have to say that I'm stunned and amazed at this app. It's very accurate and easy to use. It's not often that an app such as this actually lives up to its hype but this one definitely does. So far this app has now become my absolute favorite measuring app. I ran it through a few tests and it works great. I plan to do more testing but I'm happy with the results so far. I would like to see decimal angle measurements (even angles less than 1 degree) and allow us to set angle decimal place accuracy. Added the things I needed including a magnifier and being able to type in dimensions, very useful and developer answers my questions quickly, well worth the price just for the support and updates. Wow, really speeds things up, I've already experimented with this while on a job using the other at same time, and this one has been a god send. Very fast to get measurements in. Update has my feature request thanks developer. © 2015 PictureEngineCompany, Inc. All rights reserved.